In a second email sent that same day, McQueary complained to Eshbach about "being misrepresented" in the media. McQueary appeared to be contradicting a Sara Ganim report by telling Eshbach, "I never went to Coach Paterno's house with my father . . . It was me and only me . . . he was out of town the night before . . ."
"I know that a lot of this stuff is incorrect and it is hard not to respond," Eshbach responded in an email to McQueary. "But you can't." In their petition, Sandusy's lawyers wrote that they just received a copy of that email echange on Oct. 10th, and that it had not been turned over previously to Sandusky's trial attorney, Joseph Amendola. "This email exchange, which is attached, is evidence that McQueary's statements that he met with his father regarding observing Mr. Sandusky in the shower with a child the same night is inaccurate as Michael McQueary indicates that his father was not actually in town," the lawyers wrote. In the McQueary email, there's some confusion over whether the person that McQueary said was out of town was his father, or Coach Joe Paterno. Either way, the defense lawyers write, it's a problem for the prosecution. "To the extent that the email could be construed as Mr. McQueary stating that Mr. Paterno was not in town, it is believed . . . that Mr. Paterno was home and therefore that also could have been impeachment evidence," the lawyers wrote. In their petition, Sandusky's lawyers say the email exchange where McQueary claims the AG's office twisted his words was evidence of prosecutorial misconduct. The defense lawyers previously gave the judge in the PCRA hearing a transcript from the Graham Spanier case, where McQueary disclosed on the witness stand that the AG's office had informed him that they were going to leak the grand jury report to the media. "None of this information had previously been provided by the office of attorney general," Sandusky's lawyers wrote the judge. This "additional information is further evidence of the prosecution's failure to turnover Brady impeachment evidence," the lawyers wrote, referring to the landmark U.S. Supreme Court case, Brady v. Maryland, where the court ruled that all evidence that could benefit a defendant must be turned over to the defense. At the end of their petition, Sandusky's lawyers ask for a hearing where Eshbach, McQueary and Amendola would be summoned to testify "as to whether such information was disclosed and/or received by trial counsel in conjunction with previously raised Brady claims." And the real story starts to unfold... which is what most of us already knew. In no reasonable court of law would MM be considered a credible witness - only in Bellefonte, PA where the good 'ole boys bend over and pull their pants down for the AG's office. Where is common sense, fairness, and the constitution when you need it? The AG's office and former Governer Tom Corbett are a joke and karma will return the favor when appropriate. Best of luck to all who knowingly screwed this up. Not saying Sandusky is innocent; but the truth of this story will never be known because of how BAD the AGs office messed this up. MM should be ashamed of himself but it is clear he has no conscience or soul for that matter. Excellent comment! We're getting there as 'the real story starts to unfold'. But there is another larger real story that needs to unfold if this country is ever going to eliminate the massive corruption that has severely crippled the integrity of our government. I think you and others know, what the other "larger real story is that I'm talking about". All of these smaller injustices, such as the PSU "scandal", will continue to happen throughout our country with ever-increasing frequency, until the 'larger real story' has been unfolded. As citizens of this great country, we should all be guaranteed the right to a fair trial on a level playing field, with a prosecutor that is seeking justice as opposed to a notch in his or her belt. The Attorney General has an obligation to make sure this happens and to protect the citizens from a zealous prosecutor who does not abide by the rules. The Courts must step in when necessary to insure we citizens are afforded our rights. The only answer that I see is to severely punish those in the government that violate these rules. A slap on the wrist, a reprimand by a Judge, a "don't let it happen again" approach DOES NOT work. He/she that is afforded the authority of a prosecutor has unparalleled power and with that they must be held accountable when they violate that power and trust. Who is there to protect us--Congress, the Judiciary, the Jury, our State Representatives--no one, other than the Jury and a few others in select cases are stepping to the plate. An embarrassing day for the mainstream media when a court motion references an article on this blog because all the newspapers, magazines and TV networks refused to report on the McQueary-Eshbach emails. I think we all know by now the mainstream media doesn't embarrass. There was a time when they would have been embarrassed by these so-called oversights on their part. I've said it before and I'll say it again, the mainstream media is our government---they are now the same entity. Why do they refuse to print truth? Why do they only print lies? Because, they are willing partners in massive government corruption. At this point, I could launch into my usual lecture about 9/11 and how it has changed this country and given corruption the upper hand, but I won't. Blogs such as this and underground truthseekers will continue to make progress in the current media climate... why? Because every day more and more American's grow tired of the same political news stories shoved down our throats. We, as a country, are ready for real news with true investigative journalism circa 1980s-1990s. Today, a reporter sees a tweet from a friend's friend who thinks he knows something and next think you know its "news" and a "source" reported it. Watch the first season of Dark Net on Showtime and you'll see how bad this media stuff really is. The Brady violation regarding this email is more significant in the Graham Spanier case than it is in the Sandusky case. There were eight living, breathing victims who testified against Sandusky and it is almost certain he could have been convicted without McQueary's testimony. McQueary was the eight witness called by the prosecution and, according to jurors, the case was decided on the testimony of the first witness on the first day. In contrast, the entire Spanier case rested upon the reliability of McQueary's testimony regarding what he told PSU officials about the incident. Recall that Curley, Schultz, and Spanier were originally scheduled to be tried in January 2013 -- as such, the Commonwealth -- and Penn State University, who provided the email -- were completely willing to let these men stand trial knowing that this evidence was not made available. While this is impeachment evidence, the bigger story is that EXCULPATORY evidence was also withheld in the Spanier case. 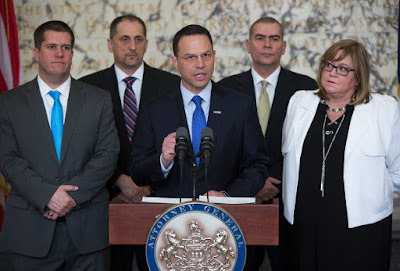 Unfortunately, the PA OAG is using the shield of grand jury secrecy to keep honest individuals from putting this information into the public domain. I'm not sure Spanier's lawyer would have used the emails anyway as he put up a lackluster defense assuming the jury would decide on the facts presented at trial, properly apply the law and use reasonable doubt. Spanier's appeal seems all about the statute of limitations, improper use of a retroactive child endangerment law and errors by the judge.